Our newest member of the San Diego Zoo is shown at three hours old with mother and sister providing a tongue bath and much TLC. Photo April 16, 2009 at 1:30pm. 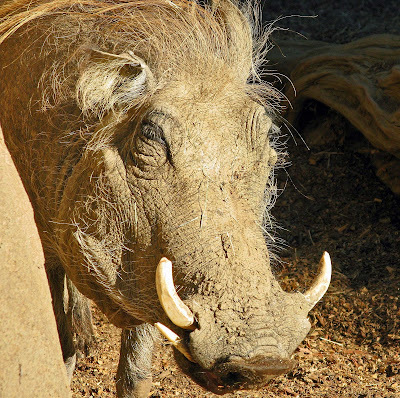 The southern warthog may not appear to be as beautiful as some of the other animals at the San Diego Zoo. But the warthogs are remarkable for their strength, intelligence and ability to adapt and survive. Keeper Leslie looks after the warthogs with a wide range of duties that includes food prepartion, administer medications, observation, keeping records and cleaning their enclosure. The last picture below shows Leslie in the service shed behind the warthog exhibit. 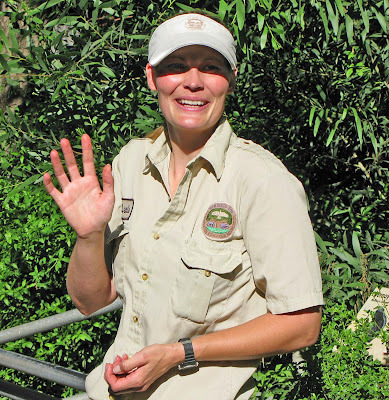 Take a couple of extra minutes on your next visit, say hello to Leslie if you see her and maybe you will fall in love with the warthog just like the zoo staff. 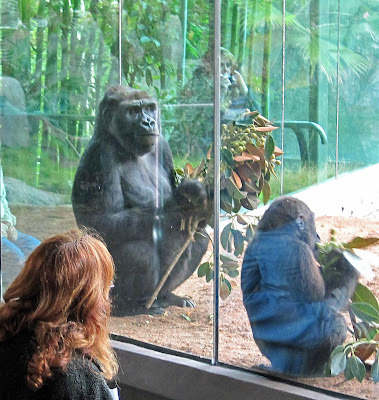 Many people like to compare gorillas with humans, our closest relative. 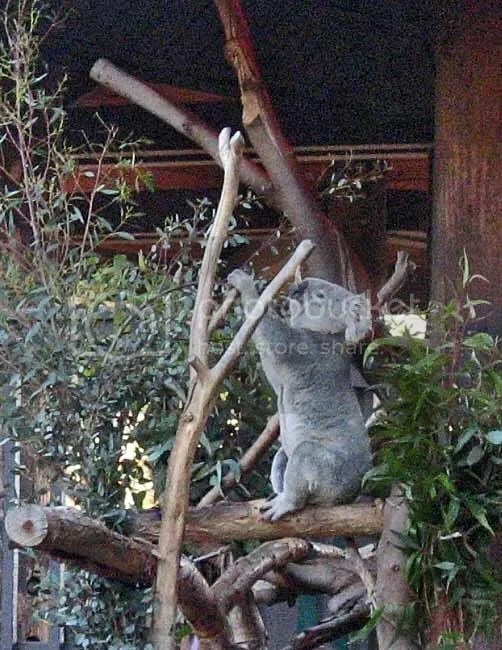 They can stand upright but prefer to walk using their hands as well as their legs. Our arms are much shorter. Do they have a sense of humor? Watching them at the zoo I would say no. But I have no doubt there is serious intelligence and much thinking going on. 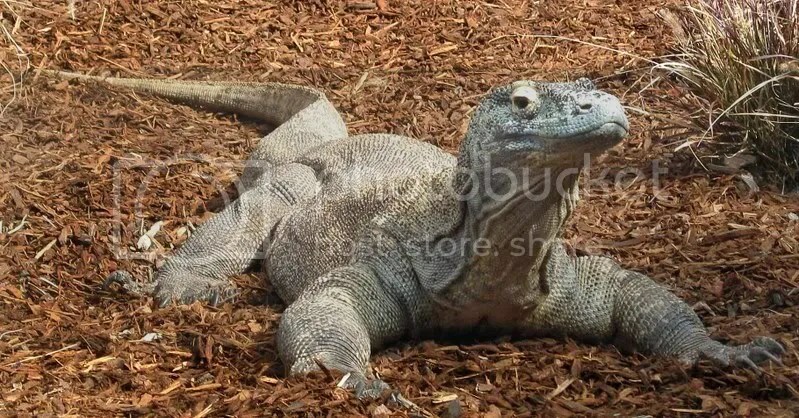 The komodo monitor or “dragon” is listed as “vulnerable”, endangered, by the IUCN (International Union for Conservation of Nature). They were discover by western scientists in 1910. This one at the San Diego Zoo is large (2.5 meters long) and fearsome making it a great favorite for the kids. 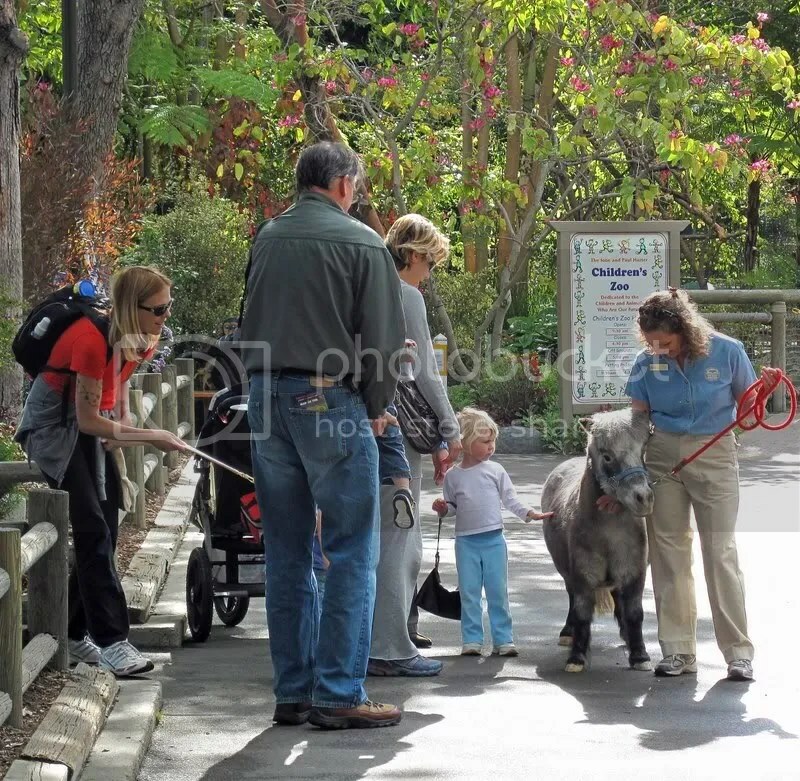 San Diego Zoo attracts lots of families. 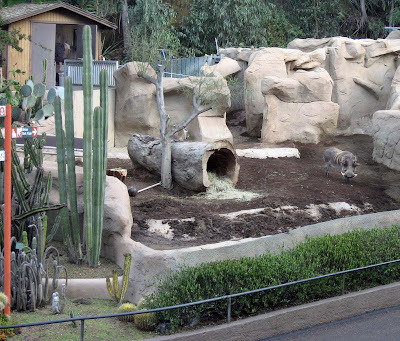 Many families living in San Diego buy an annual membership and enjoy the zoo often, a great time and wonderful bargain. 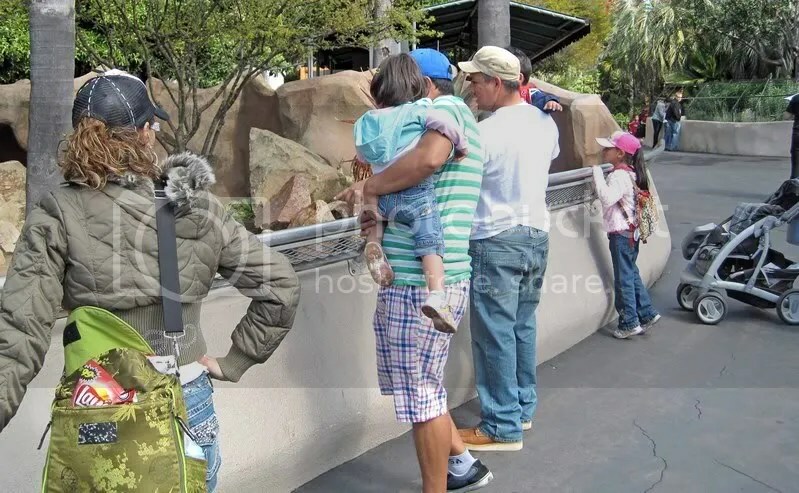 These pictures show some families near the Children’s Zoo entrance. Keepers bring out the miniture horses for a walk in the morning. Get to the zoo when it opens at 9am and take the kids over to that area. Flamingos at the San Diego Zoo. My picture today is San Diego Zoo Keeper Nate, caretaker and spokesman for the lowland gorillas. Nate is dedicated and passionate about the survival of lowland gorillas, both the ones at the zoo in his care and those in the wild. He ask us all to help by recycling old cellphones. What’s the connection? Well, cell phones contain a rare ore called coltan (short for columbite-tantalite) which is found in central Africa. The popularity of cellphones has increased mining operations in wildlife reserves including Kahuzi-Biega National Park and Okapi Wildlife Reserve. Illegal miners invade the “protected” parks and endanger the native gorillas. How can you help? Turn in your old cell phone to any recycling program where you live. 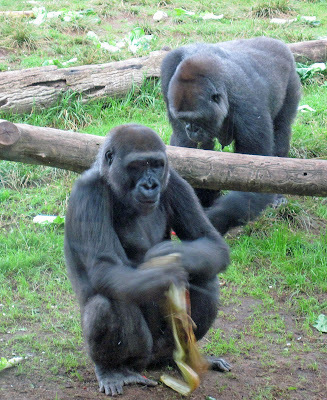 The recycled cell phone will reduced the need to mine more coltan and help protect the wild gorilla habitat. 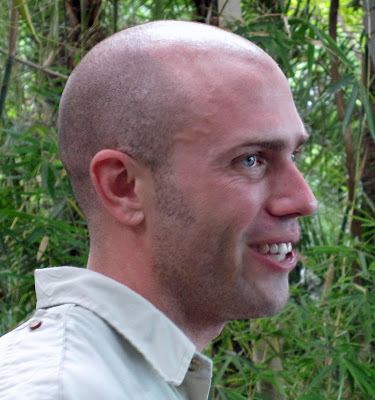 Nate thanks you, I thank you and so do these beautiful primates. 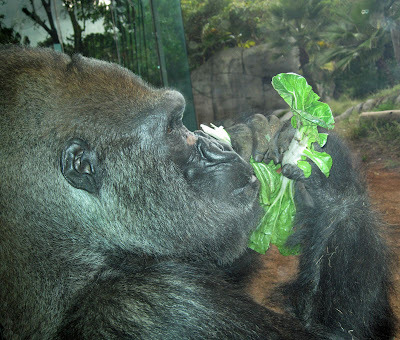 Memba, 40 years old, is the strong experienced male leader, or silverback, of his western lowland gorilla troop at the San Diego Zoo. 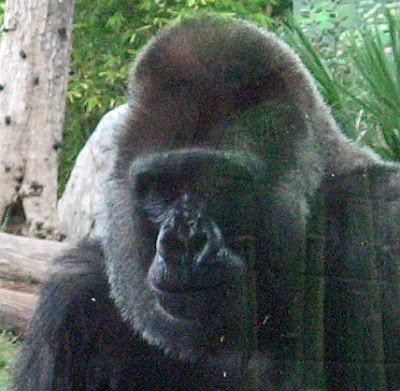 Memba and all the lowland gorillas need your help. Please recycle your old cell phone. Read more here. The zoo escalators are pretty long but no where near a record. The longest single-span uninterrupted escalator in the Western Hemisphere is at the Wheaton station of the Washington Metro system (230 feet long, 2 min 45 sec ride time). I have actually taken the third longest ride, the one at Rosslyn station (205 ft 8 in). The San Diego Zoo also includes a full animal hospital. This picture shows a blue crowned pigeon being prepared for a digital xray. The host for my visit to the San Diego Zoo Hospital was Senior Veterinarian Dr. Meg Sutherland-Smith seen on the right in this picture. 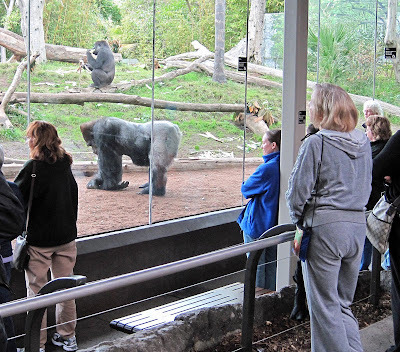 My inside look was very special because zoo visitors, members and staff are almost never allowed inside. Read more about my visit and see more pictures at this link. Plan on getting to the zoo early for a more imtimate look at the animals. I took this picture just a first sunlight was reaching the Canyon Cafe. 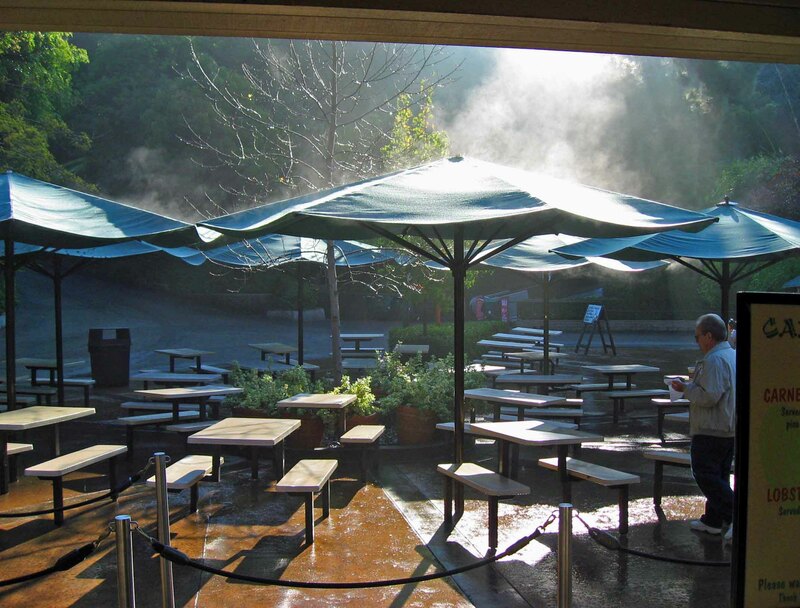 Morning dew was rising off the umbrellas as steam. 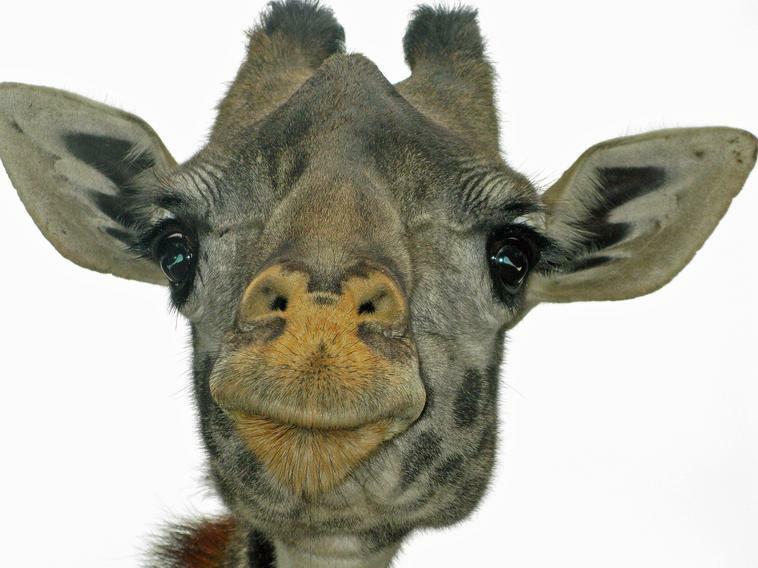 Travis is a young male Masai giraffe born at the San Diego Zoo on August 7, 2006. His mother is Abby and father is Silver. Travis was 6 foot tall at birth and weighted 143 lbs.